problematic, one pigeon hole I’ve most struggled to squeeze myself into – the one labelled ‘female’. it’s becoming easier to have these types of conversations, something feels like it’s being lost. As if now there is such a wide selection of labels and categories to choose from, there simply must be an identity that ‘fits’ each person. At its extreme, could this result in women who express themselves in what is considered a ‘male’ way struggling to identify as actual women? Is there an expectation that we will all be able to relax and get along beautifully only once have comprehensively mapped everyone’s characteristics and assigned each other the right category? This clearly leaves little room for individuality, anonymity, mystery, doubt, uncertainty, subtlety, or – God forbid – changing one’s mind. Are we being encouraged to “pick a category” and then “stick with it”? How is one supposed to grow and change for one thing? 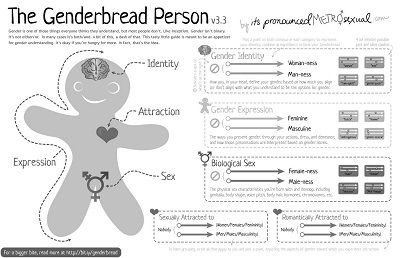 Rather than tick boxes and labels I prefer the sliding scales of the genderbread person as a more realistic attempt at representing the complexity of gender. For one thing categories alone don’t account for how we might have experienced the world to date, before there were so many categories, and how those experiences may contribute to how we see ourselves now, and to our identity. ever growing and changing – whatever our gender, sexuality, hairstyle or adeptness with a bread knife. þ – Unique human (please provide tea, biscuits and years of friendship if you wish to know more).